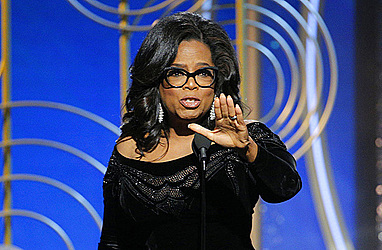 DES MOINES, Iowa (AP) — Oprah Winfrey's impassioned call for "a brighter morning even in our darkest nights" at the Golden Globes has Democratic Party activists buzzing about the media superstar and the 2020 presidential race — even if it's only a fantasy. Even so, for Democrats in early voting states, and perhaps for a public that largely disapproves of President Donald Trump's job performance, the notion of a popular media figure as a presidential candidate is not as strange as it once seemed, given the New York real estate mogul and reality TV star now in the White House. "Look, it's ridiculous — and I get that," said Brad Anderson, Barack Obama's 2012 Iowa campaign director. While he supports the idea of Winfrey running, it would also punctuate how Trump's candidacy has altered political norms. "At the same time, politics is ridiculous right now." Winfrey's speech as she accepted the Cecil B. DeMille lifetime achievement award on Sunday touched on her humble upbringing and childhood wonder in civil rights heroes. But it was her exhortation of the legions of women who have called out sexual harassers — and her dream of a day "when nobody has to say 'me too' again" — that got some political operatives, in early voting states such as Iowa and New Hampshire, thinking Winfrey might be just what the Democrats need. "I think we need more role models like her that are speaking to young women and trying to restore some hope. The election of Donald Trump was a devastating setback for little girls," said Liz Purdy, who led Democrat Hillary Clinton's 2008 New Hampshire presidential primary campaign. Trump's job approval rating sat at just 32 percent in December, according to an Associated Press-NORC poll. And though polls show his approval up slightly since, Trump is the least popular first-year president on record. He has also been accused by multiple women of sexual misconduct, though he has vehemently denied the allegations. Winfrey, in September and October, publicly dismissed the notion of seeking the nation's highest office, though she noted that Trump's victory made her rethink the requirements of the office. A representative for Winfrey did not reply to a request Monday for comment from The Associated Press. Winfrey's longtime partner, Stedman Graham, told the Los Angeles Times that "it's up to the people" whether she will be president, adding, "She would absolutely do it." Winfrey, 64, has become a cultural phenomenon over the past 30-plus years, born into a poor home in Mississippi but breaking through as a television news and talk show personality in the 1980s. Over 30 years, she became the face of television talk shows, starred and produced feature films, and began her own network. Trump himself has lavished praise on Winfrey over the years, including in 2015, when he said that he would consider her as a running mate on his Republican ticket. "I like Oprah," Trump told ABC News in June 2015. "I think Oprah would be great. I'd love to have Oprah. I think we'd win easily, actually." It echoed comments Trump made in 1999, when he was weighing a presidential candidacy in the Reform Party. "If she'd do it, she'd be fantastic. I mean, she's popular, she's brilliant, she's a wonderful woman," Trump told CNN's Larry King. Some operatives think she has what it takes to be a viable presidential candidate. "She would be a serious candidate," said Jennifer Palmieri, former White House communications director under President Barack Obama and the communications director for Hillary Clinton's 2016 campaign. Beyond her rise from poverty, Winfrey's success as a multidimensional media figure has come from promoting ways for women to assert themselves, typically outside the political arena. That could soften what Palmieri describes as an enduring resistance among some voters to women with political ambition. "I think lessons we all learned from watching Hillary's run, and how her ambition was unfavorably and unfairly viewed, coupled with Oprah's existing popularity, could give Oprah a strong start," Palmieri said. That's not to say Winfrey can't claim any significant political influence. She notably headlined an Iowa rally for then-Sen. Barack Obama in the weeks leading up to his surprise victory in the state's 2008 leadoff nominating caucuses, which helped propel him to the presidential nomination. Still, while some Democrats would embrace Winfrey's outsider-celebrity status as the party's answer to Trump, House Minority Leader Nancy Pelosi, D-Calif., noted that Winfrey, like Trump, lacks any kind of experience in government. "I think one of the arguments for Oprah is 45," Pelosi said, referring to Trump in shorthand for the 45th president. "I think one of the arguments against Oprah is 45."